We spoke to Truro and Penwith College and the Manchester Film School about their different approaches to teaching filmmaking at FE level, and the success their methods are having. In recent years, some of the most exciting productions to emerge from the Learning on Screen Awards have been those submitted in the student categories. In 2017 our Special Jury Award was won by University College London student Fernando Mitjans, for his astonishing documentary Limpiadores. The previous year the same prize was picked up by an even younger filmmaker. George Summers from Truro and Penwith College won the trophy with his stop motion animation film Just Some Morning Tea, as well as winning in the Further Education category. At the time of winning Summers was 17 years old, his film a piece of work he had submitted for assessment on his A Level filmmaking course. Following on from his success at the Learning on Screen Awards he then went onto win a Moving Image Award for Best Short Film in October 2016. His wins at both award shows led to national and local press, including a feature on BBC Radio Cornwall. 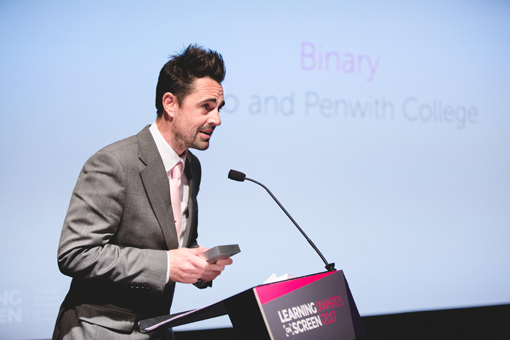 Summers’ success was clearly not a one-off however, as Truro and Penwith College students Seamus Tyrell, Harvey James-Dyer and Alex Smith also scooped the Further Education Award a year later in 2017, with their film Binary. The Manchester Film School has been another college that has achieved great success at the awards in the last few years. In 2016 director James Oliver was nominated in the College Higher Education category for his film Loved App, and in 2017 the school achieved three nominations, a special commendation for James Oliver’s Stars on Mars and a win for Matthew Swallow, with his film Mr Perfect. Following the Learning on Screen Awards, Oliver’s Stars on Mars scooped a prize at the Royal Television Society Awards 2017. 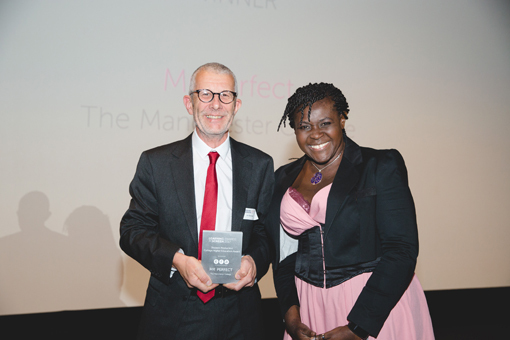 Jim Grainger accepting the College HE Award from guest speaker Maggie Aderin-Pocock, on behalf of Mr Perfect director Matthew Swallow. The Manchester Film School takes a different approach, but like Truro, they are keen to avoid classroom-only assignments. Grainger explained to us that students do not follow briefs, they have full creative control over what they make, however, the school’s innovative approach to getting students ‘work ready’ means the school is structured hierarchically, like a working production would be. First year students get an overview of roles from industry freelancers (grips, production designers, writers etc). They are set a series of exercises and then at end of their first year write a script about anything they like. In the second year, six or seven are shortlisted for production by a writer’s circle of students. Once a script has been green lit it goes into production with the student who wrote it directing. They then choose department heads from third year students; those department heads chose crew from second year students, and those crew members chose assistants from first year students – creating a production team of between 20 and 30. This means students are chosen to work on productions when they have proven themselves, and are also able to learn skills from those with more experience. By the time students hit the third year they are learning from freelancers on real productions, and passing down industry standard knowledge. This continues on into the professional space; the connections that students make with industry freelancers form their pathways into the industry. Most students get work by becoming a trainee to a freelancer they have met on the course, and work their way up from there. Then when a student is working in the industry, they themselves are in a position to pass on opportunities to students a year or two below them, creating a huge network of students and ex-students – this number is currently around 180 and growing. Grainger told us that this network led to four generations of students working on ITV’s Happy Valley. The school has also produced students who have gone onto working Downton Abbey and a recent Shane Meadows production. One of the school’s biggest success stories is Christopher TJ McGuire, a steadicam operator who has worked on Pitch Perfect 2, Jason Bourne and Harry Potter and the Deathly Hallows Part I and Part II, to name a few. Although the colleges’ approaches may differ, students at both institutions are enthusiastic to get recognition for their work. Clark told us that student work is frequently exhibited and entered into external shows and competitions. National competitions such as the Learning on Screen Awards allow the students to test their abilities and outcomes against talented young creatives across the country. He explained that having FE work standing next to high-quality under and postgraduate productions, as well as professional broadcast material, has been hugely inspiring for his learners. Most of Clark’s students have aspirations of pursuing careers in the creative industries, so awards and festival experience has proved extremely motivational, encouraging them to continue with filmmaking into HE and work on their own personal filmmaking projects. Clark said attending ceremonies like Learning on Screen have given his students the opportunity to network and make contacts with other creative professionals, helping them build confidence in their work and enabling them to build professional feedback into their craft. National competitions such as the Learning on Screen Awards allow the students to test their abilities and outcomes against talented young creatives across the country. At the Manchester Film School, Grainger told us that the students themselves drive award and festival submissions. It started when two students entered their work into a festival in the USA and won $100, coming second place a crew that had previously produced one of the dancing iPod commercials for Apple. News of the success spread quickly, and students began submitting their work to awards and festivals across the world. In addition to the extra recognition they have received for their work, Grainger said it has made the students more focused about the kind of films they produce, targeting specific awards and festivals with certain types of productions. Grainger likewise explained that taking the awards out to recruitment events to actually show prospective students what they can achieve has been a big help with application numbers. It is encouraging to see Truro and Penwith College and The Manchester Film School emerging as FE leaders in filmmaking education, because of their different but equally innovative approaches. Their students have had a lot of success in the last few years, in our own awards show and others. We cannot wait to see what they come up with next.